You may have heard of Laura Clark. She’s the one who lives in an undergound toilet, um, yes that’s the one! Laura memorably came onto our screens in Channel 4’s George Clarke’s Amazing Spaces (Series 1 Episode 2) in 2012. Living in an underground toilet in South-East London isn’t for everyone but Laura isn’t everyone – she’s a queen of micro-regeneration! Laura spotted the boarded up opportunity in 2005 after completing her degree at Glasgow School of Art. 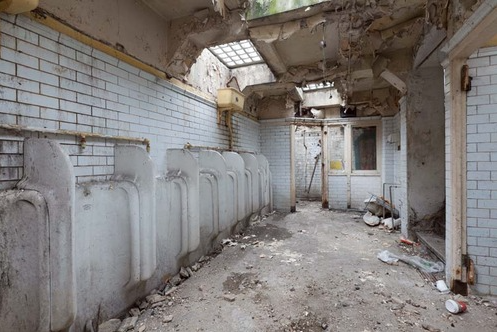 The loos were built in 1929 and last used in the 80s so the 6000 sq ft were in a terrible state. Her initial ideas for the space were as a cinema or bar but complications with council boundaries and the economy meant she had to go back to the drawing board and a one bedroomed flat was conceived. With no views and limited light it took a great deal of vision to see this project through which is why we are thrilled Laura is giving her unique view on all things ‘eco’ and ‘modern’ for our first ‘monthly musing’ of 2013. So what does eco mean for you right now? To me, eco means creating a building that is in some way much more than the sum of its parts. Whether that means a zero carbon build, creating a life long family home on a tiny budget or the construction of a project that brings life to a community, the building is ultimately an asset for the future. Although the adding on of ‘green’ elements such as solar panels can be a great idea for retrospective fit outs or extensions, I feel it is important for the integration of sustainable technologies at concept design stage rather than a happy extra if the budget allows as can sometimes be the case. 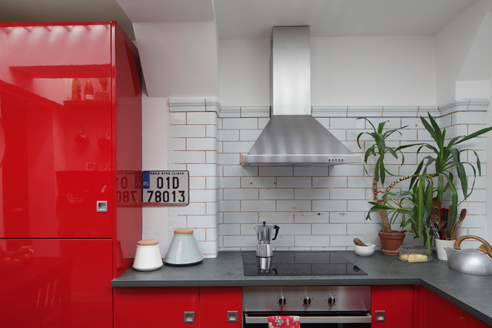 Laura kept the original tiles as a kitchen ‘splash back’. As well as renewable energy, highly efficient insulation and natural materials I think there is also a human element of eco construction. In terms of sustainability in the community context, using local trades but also craftsmen from all over the world will help to broaden our skill sets and ideas that can help catalyse the future of sustainable architecture and building. Today, it is so easy to share technological and ecological advances in construction, yet currently the building of the average domestic new build or extension remains quite antiquated. It seems that manufacturers are sometimes playing catch up with the eco conscious householder rather than being at the forefront of design technology driving forward a real fundamental change. At the moment, although most clients would really like to have some form of ecological addition to their home, it is usually the first thing to go when the budget is tight. I think that low or zero VAT incentive schemes for sustainable domestic building projects should readily available, easily obtained and nationwide. And modern? what does that mean for you right now? I like the idea of modern or contemporary style actually being hidden in the detailing as well as an outward expression of taste. For me, keeping a build clean lined, elegant and simple means that your clients own taste and style can be easily expressed. With innovative, practical and well planned spaces, as a family lives and grows in their home, superficial decorative changes can be made over the years but the architecture of the house can remain untouched. The way I have fitted out the underground toilet renovation with floating shelves down the spine wall is an example of hidden detailing. 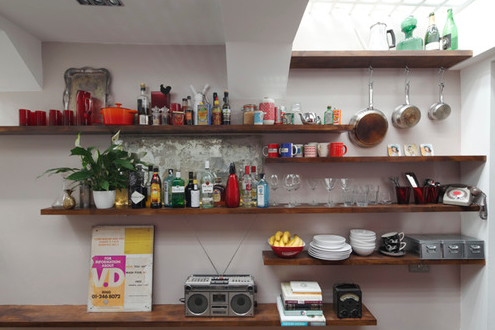 On the one hand they are contemporary as they have no visible fittings but conversely the idea of open wooden shelves has an element of Shaker influence. Designing the invisible fixtures in order for these oak block shelves to take weight was crucial in achieving this contemporary floating shelf style. I feel it is within the design of your detailing that you can take ideas and express your own style. Building this conversion as a development meant that I was the Architect as well as the client. Having this element of control over a project really allows your style to be expressed. Personal style is influenced by so much as well as just architecture, and I love this idea of the fusion of design and everyday experience informing individual architectural styles. What’s the hardest lesson you had to learn in business? Leave the accounts to someone with brains! You can see more of Laura’s work on her company Lamp Architects website here.